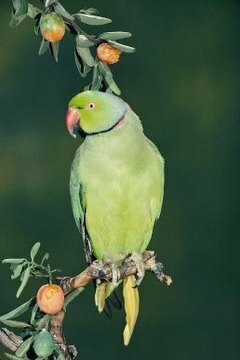 African and Indian ringneck parakeets in captivity can live to be 20 to 30 years old. There are some reports of ringnecks living up to 50 years. Taking conscious steps to keep them healthy and happy is the key to a long life span. Though ringnecks don't usually like to cuddle, they do thrive on interaction with people. With gentle handling and patience, they'll sit on their humans' shoulders. They form strong bonds with their human companions, and many imitate their speech. Toys that can be rotated in and out of use will keep a ringneck from becoming bored. They aren't big chewers, but toys with bells, ropes and wood are good choices. A play stand outside the cage will keep them amused, too. A well-rounded diet helps a ringneck parakeet live a long, healthy life. Alternate between pellets and seeds and add fresh foods. Ringnecks love fruit: apples, strawberries, melon, grapes, oranges, kiwis, pears and mangoes. Also offer vegetables such as raw baby carrots and lettuce leaves. Birds can die from eating avocados, fruit seeds, onion, chocolate and alcohol. Also check for dangers -- including open windows, young children and other pets -- before bringing your ringneck parakeet out of her cage. Take her once a year to an avian vet for a checkup, or more often to have her nails trimmed and wings clipped.